Co-Director, Artist/Designer, Screenprinter, Social Commentator. Yep, that's us, we like to keep it simple around here. It's a skeleton crew but nothing out of the ordinary for a small business, we multi-task and 'make do until we make dough'. 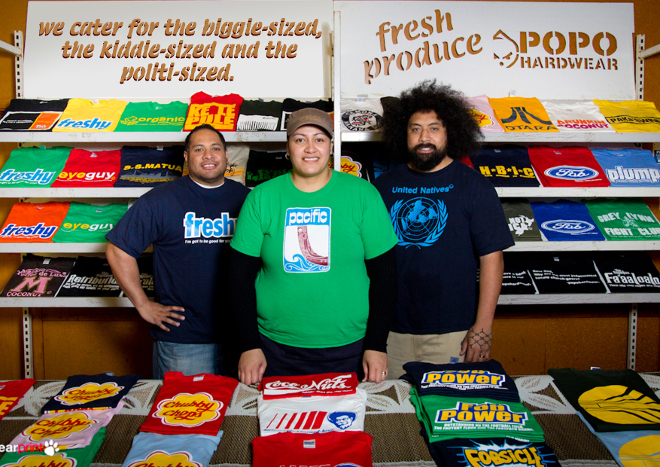 Popohardwear came about to fill various needs, first was the representaion of Kiwi kids and the Americanisation of our next generation. I wanted to create a clothing line that speaks about who we are as Kiwi's and Pacific Islanders, challenging the way we are perceived and fighting societal cliches. Popohardwear speaks about the time we live and taps into issues of identity in the hope of addressing some of these issues. I am not going to heal the World via T-shirts but I am gonna attempt to break some of the barriers that stops us saying hi to each other. It is my intention to empower the wearer, address the viewer in the hope of accomplishing a smile in the relationship of the two. The second need was to contribute to the household income (let's not beat around the bush), keeping Mum and Dad happy by sending money to family in Samoa, chipping in to extended Family expenses (weddings, birthdays, funerals of people we don't know and have never met) and of course the deposit for our place in the Palace in the sky- Church Donations (maybe that's another T-shirt idea...oh, it already is). Thanks for taking the time out to visit us, come by again if you need a T-shirt for a gift or even to wear what you're really thinking. If you just wanna laugh subscribe and we'll keep you up to date.